I’ve already dropped Jordan Eberle several spots on this Top 100 list based on what he’s done, or hasn’t done, since the start of this season. As of this writing (Jan. 4) Eberle is a moving target who is trending down. By the end of the season, he could be even lower in the eyes of many fans or he could end up right back where I had him. I expect the latter. Eberle set the bar high during his first six seasons with the Edmonton Oilers but he has struggled this season to replicate the kind of offensive success expected of him after his first 420 or so games. I’m not rating Eberle based on what he’s not – if you’re looking for a gritty, physical player who drives his line, you’re wasting your time – I’m slotting him in based on what he is, a complementary player and a producer of goals. Eberle doesn’t get paid – and he has been paid handsomely at $6 million per season coming out of his entry level contract – to bang bodies or be the first guy to lead the troops over the hill. Would it be a bonus if those dimensions were a bigger part of his game? Sure. I’d prefer it. You’d prefer it. I’m not going to pretend it doesn’t matter. I’ll take a take a 25-30 goal player who gets in your face over a guy who puts up the same numbers but plays a softer game any day. That softer guy would be Eberle. That said, Eberle’s bread and butter and his bottom line, his value to the team, is as a goal-scorer. The problem is that bottom line has slipped and that simply magnifies what he doesn’t do, thus all the consternation by fans so far this season. Understandable. Completely. If you’re a one-trick pony, you’ve got to get that trick right. The statistic that really jumps out at me is Eberle’s single-digit shooting percentage. Through 39 games (as of Jan. 4) he was at 8.0. For a player who had registered seasonal shooting percentages of 11.4, 18.9, 12.0, 14.0, 13.1 and 14.5, that’s like falling down an elevator shaft. Eberle was on pace (100 shots after 39 games) as of writing this to improve on his career-high of 200 shots on goal in 2013-14. Warts and all, Eberle had scored 145 goals in 425 games through six seasons (18-34-16-28-24-25) coming into 2016-17. That makes him a bonafide first-line right winger, even if he hasn’t played like it this season. While Eberle lacks attributes I prefer and aspects of his game leave me wanting more, I’m not going to put more weight in this season than in the previous six. Since 2005-06, just five Oilers have scored 25-or-more goals in a single season. Ryan Smyth did it twice. Dustin Penner and David Perron did it once each. Taylor Hall and Eberle did it three times each, with Eberle just missing making it four times with 24 in 2014-15. No Oiler has scored more goals than Eberle since that trip to the 2006 Stanley Cup. I’m open to debate where Eberle belongs on this list because he isn’t done here yet, be it a matter of months or years until his tenure here is over. For me, the question isn’t if he’s in the top 40 or so, but where he slots in. Might he be higher than No. 35 if he sticks around for four or five more seasons on a team that’s actually good, actually a contender? I think so. Came here to say almost the exact same thing. Lets just say for him…its a bad year to be slumping!!! I seen the article, is this to do with the tieing goal lastnight? No question he has skill, providing some offense and opportunity for fans to get a little enjoyment out of watching a not so good hockey club, over the past several years. I think the apparent slumping has more to to with changing dynamics, for the team and where Eberle fits and or doesn’t fit in. Not to bash Eberle – because he is what he is, but increasingly, the fit isn’t really there – that would allow him to regain and maintain his prior offensive numbers. If games are out of reach and or you aren’t really expected to win from the get go, when opposing teams don’t really take you all that seriously – etc etc, it creates a bit of a false environment. Whenever or however you play, during the course of play – there is a fluid line of transition. The normal expectation is to play at or slightly behind the line of transition, such that if something goes wrong – like a turnover, you’re not overly exposed. Sure – you go over the line at times, but more the exception to the rule or norm and if something goes wrong – you’re really on your horse getting back to make up for it. The false environment – had allowed Eberle and his line mates to consistently play ahead of the line of transition for a long time. Worse – when it went wrong and it often did, Eberle and Hall, really – didn’t sweat it all that much to make up for it. It’s more like – let’s conserve energy, hope they don’t score and see if we can get one more rush out of this shift. The result – sure they scored a fair number of goals, but – most times, got scored on more than what they generated. Thankfully – its more a real world environment for the hockey club now. Ebs is one of the top RW in the league who happens to be in a slump. Like Crosby or Gaborik, he will come out of it. He has 6 great seasons under his belt which, to me, speaks much louder than this season to date. Think about a player who played poorly for 6 seasons and then had a great half a season. Would you be ready to pay him $6M a year? He is our best RW by a wide margin. If we had a number of others waiting in the wings to replace him I might feel differently. We don’t. He will work through it. EBS will hopefully get hot for the rest of the season and end up with decent numbers raising his trade value for the offseason. With Chia, I don’t see EBS long term, and I don’t mind that. Keep playing like he has been he’d stay, but he is who he is and he’s not changing, and will eventually go back to old EBS. Eberle just does not fit into the team Chia is building here. I would be surprised if he made it through the summer an Oiler. Eberle just does not fit into the team Spydyr man is building here. Do you think Chia is listening to you? Do you think anybody listens to you? You obviously just did and even took the time to respond. You don’t have to worry, nobody is listening or you wouldn’t be trying to get your same point across a 1000 times. No that is just to let you know that some of us don’t agree with you. I do not agree as I see this as a slump. 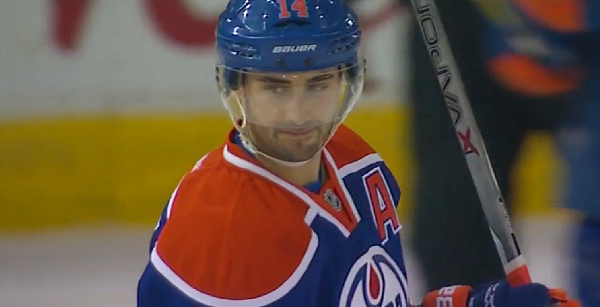 The one thing about Eberle that i want to see is how it goes in playoffs. Before becoming an Oiler he was money in the bank for anything on the big stage. As this year has brought a lot of change I expect he was feeling just a little lost with all the changes. Do not write him off just yet. Sure he won’t be getting 5-6 mill on the next contract and that is fine but he is starting to jell with his new line mates so lets just see where it all goes in the next 4 months. What’s the problem exactly with the old Ebs? That is who we have been waiting for all season and he has finally showed back up over the past half dozen games. He has been sound defensively for even longer than that. Not everyone is going to appreciate the style of this player, and I get that. However, old Ebs is a 60 to 70 point winger. So I have trouble following your “old EBS” logic. .
“Sound defensively for even longer than that”. When did that start? TM is the first coach demanding backchecking and defensive responsibility, and I agree we are seeing the effort now, but should not have to wait on a 6 year vet to buy in while rookies understand from the get go. He had a free pass under the old regime and maybe he finally realizes his coasting days are over. Just don’t see him as a long term fit. This team needs Eberle to score goals. You don’t want too many guys like him on your team but you do need a couple. If/when they trade him, this team will spend the next 3-4 years looking for somebody to replace the offence he brings to the line up. I don’t think replacing his nine goals will be too difficult.The team seems to be doing quite well despite Eberle contribution of nine goals.Imagine a player bringing those nine goals and being defensively sound and hard to play against. Or, imagine when Eberle rebounds and pots 25 goals per season along with what the rest of the team is doing. That would relate to about 5-7 more wins, possibly? Make us first in the Pacific? Wouldn’t that look a lot better than trying to replace Eberle with more defence. At some point, we will need more than just McDavid/Maroon/Drai to score us goals. Its not feasible to expect their hot streak to last anymore than Eberle’s cold streak to continue. I, for one, really appreciate seeing him try so hard this past few games. He has been a treat to watch and reminds us of the skill that he brings to the team when he turns it on. Does he need to bring that same determination with more consistency? Of course! You enjoy looking at the negative in everyone instead of realistically taking Eberle for what he is. 6 seasons defines his average, not 44 games. He will rebound, he will get better, and he will fall back to who he always was. And we will be a lot better team for it when that happens. Sure he may get 25 goals again but he will still hurt his team more by being on the ice for more goals against then he scores. A constant throughout his NHL career. He has been on a shutdown line with rnh the past 5 games? He has been more worried about his defensive play as of late and its shown. Yes, he has been playing better as of late. No argument here. Sure – and I agree playing better and that’s good. But wait – you got a former 1st overall, and two first rounders who are all vets making a collective $16 mil. Playing shut down? No – it should be better described as playing for real top 6 and yeah – you’re getting their number ones up front but the number 2’s in the back end and the expectation is just shut down? You would think the expectation is you strive to get one and don’t give up any. Real world stuff for Eberle – for a change. Yes that first overall is playing shutdown, not all first overall are McDavid, but playing a shutdown role he still ranked 2nd in points for his draft year. Who do you expect on Edmonton to play a shutdown role against top players? Cagulia isnt experienced enough, you want to put our 4th line for 15+ minutes a game? This wasnt Chia doing (lucic yes) but Pou, Hopkins, Eberle were gifted contracts by MacT and Lowe. You think they will make that+ more coming to next contract? Hopkins, sure -11 this year not the best points per game, but he isnt exactly pouliot and taking penalities or the old eberle and yawning/gliding. You cant put Drai or maroon on the 2nd line with the chemistry he has with McDavid. So may I ask you a question? Who are your lines and who would you put out to be a shutdown line? Pouliot – Nuge – Eberle – as veteran top 6 pedigree and experienced guys, should be expected to best – not shut down, an opposing top 3 / 2nd pairing match up. That’s a real two way mission in the real world of top 6. McL – undoubtedly wants them to score and not get scored on. Best them. What do we expect from them is the question I have? Eberle we were expecting what a solid 25+ goal scorer per year (he reached 30 once) and has been getting 20+ per year, okay so this year time got reduced (player weaker opponents as a 2nd line player) and he just got to 9? He has been playing defense and actually motivated more so I wont fault him there. Hopkins and pouliot what were our expectations? That is why its hard to exactly to say they arnt panning out, I mean pouliot we expected to be more of a power forward and he hasnt been using that shot nor speed enough. Hopkins is that first overall and we been trying hard to get him to be a two way type player, his numbers arnt the best, his defensive play isnt the best but, did we expect 90 point seasons? did we expect him as a 3rd line checking center at his size? Just what was the expectations for these players this year KNOWING mcdavid was our number one center. Be a damn good – net productive second line, or we will have to develop and or acquire one that is. damn good is a relative term? In what aspect of damn good? You mean putting up a 70 point season but yet have no defensive zone awareness? is that good? I mean that what it looks like your saying here. I have been saying this for how long to put him on a shutdown role? Yet just like a lot of other players on this role, the fanbase on this website complain he isnt putting enough points up. Sure we cant expect Eberle to put up 25+ goals this season, and I personally am okay with that. I personally want to see Eberle try and hustle. He has been showing he can actually be motivated. Sure he may score 25+ goals for another team as someone mention and not make the playoffs, just reminds me of that other guy who threw a hissy fit and shown his true maturity in that locker room, Hall I think his name was. Don’t understand why so many trashes for a provable statement. It is a fact and indisputable just like the sky is blue. The statement Jordan Eberle “will still hurt his team more by being on the ice for more goals against then he scores” is simply meaningless as a measure of a player’s contribution. If Spydyr really means “on the ice” and “scores” as in Eb’s TOI and the “goals” that Eberle scores, then he’s asking something of Eberle that virtually no other player has done: match his own goals against the goals scored by all opposition against him, whether 5V5, PP or PK. That’s just a meaningless number. But if we’re talking about on the ice for points rather than his own goals, then the statement is false and Spyder knows this (he’s said versions of this statement about half a dozen times). Over his career Eb’s is a -52 in +/- but he’s got over 100 PP points so he’s clearly been “on the ice” for more goals for than goals against. Give it a rest man! Well let’s see currently he is ranked 20th as of today. Not Bad/Not Great but it also has to be noted that he is having an off year. I think too worried about the generation of offence by a one dimensional individual. You replace with a guy who can score but brings more to the table, such that there is a chunk of direct scoring, a chunk of more scoring by committee and a chunk of savings via fewer GA’s. The net chunks surpass – what you would lose minus Eberle, particularly – if you dont believe a return to prior offensive production is gonna happen. I don’t believe it will. In the interim – the more the better though – for increased trade value. The last 10 games Eberle’s been very good in both ends of the ice. I know he still does those fly bys, when he should be rubbing guys out. His points are going to come, he’s still going to get his 50+ points this season. The problem with the RNH line the last 10 games has been at left wing. Pouliot will have one decent game and then one bad game. Hopefully they can move him in the off season. I have no personal attachment to Eberle, if they could move him for a decent return so be it, but they can’t afford to bleed skill, aka like PC did in Boston. The young Finn is still a couple years away from filling the void. I would hope – that Puljujarvi can contribute next year. It might take 2. If – Eberle doesn’t fit PC’s plan, he gonna need both Puljujarvi and another replacement veteran top 6 power right winger. That is – unless Nuge can play rw with McD. It’s possible (certainly worth a look at some point) that Nuge, can maybe bring a good chunk of what Drai brings to that Maroon – McD table. I know I get trashed for it, but – Lucic needs Drai and at some point McL will have to stop torturing the big guy. Lucic needs to change his off season training regime, like Maroon did and lose 20 pounds of muscle. Ferraro made a good comment on the radio yesterday about guys no longer beefing up the way Lucic does. It wasn’t meant as a comment on Lucic, but it relates. Part of the issue, but the other part is getting guys with Lucic who can play his o zone style. Drai is his only hope at centre and I’m not sure what you do on the right side. Eberle is not the answer. I would give Kassian a go but he has thus far proven too short on offence. Pitlick would have been a good guy to try. The Oilers have to stop squandering possessions, with premature limp @ss, mostly useless mass shooting toward net. Particularly – when it involves Lucic. Have you thought of trying hopkins on the wing? Lucic was a mistake. Sure he is big but does he really use his size? I notice his idea of a screen is standing to the side of the goalie. And I am sorry from what I have seen, he doesn’t have the hands to do that. So, exactly like his Oiler career up until this season? He is a whole -1 oh my GOD what a drag on a team. Where was all this “ebs doesnt fit this team” at the start of the year? The guy has been slumping, all players do. Who would you replace him with? Some will say trade him for a right shooting D man. If that happens, who will fill his role because the right wing is weak. Or if we trade him for another right winger and someone else? No player in return will have the same scoring ability and hands as him. Maybe it will free up cap space. It will be another situation like Hall. Yeah we have larsson who is solid, then signed lucic to fill the left side. Lucic has been a boat anchor and can barely play 3rd line. The way he has been playing recently there is no upside to trading him. I’m hoping he gets really hot. Does well in the playoffs and chia then trades him for young, cheap talent to fill out the bottom two lines. Eberle is too expensive to keep next year onward. each goal had a bit of a slump bust to it- Khassian monkey off his back, Oil PP gets a much needed goal from Letestu (bit of a stretch), the clutch in Ebs’ game tying slump busting beauty! he almost won the game too, but there was more redemption to be had – a McDavid GW goal with seconds to go actually COUNTING! I think we are now seeing Nuge and Ebs and Pouliot re-establish themselves as key stars in the McDavid constellation. my analogy is to bands – the key is fitting in WITH the band. It isn’t the Eberle/Hall/Nuge show anymore. You had to know Ebs would come around, clutch that we didn’t ship him off too soon. You sure that was not Methcat? Eberle has been a good Oiler, I’m hoping this past month and a half was just a slump and he really rebounds down the stretch. He has scored some big goals in his career and I think he has some playoff magic in him. That said, I thought he was terrible last night. Last game he was mucking it up, flying around the ice and backchecking hard. He will never be a gritty player but last night he seemed like he couldn’t be bothered with any sort of contact or too much effort to chase a puck. He suddenly had some fire when they came out for the third though, I wonder if McL ripped them a bit in that intermission?? Pretty tough to say if he’s here next season, I guess that depends on what happens in the next 2 months. I would think if they could land a good RW in the summer and find a taker for Ebs they would move him. As others have said, he’s not a Chia type player, but they absolutely can’t bail on him if they dont replace him immediately. Tough call, but I would bet he would disappear faster than a pizza at a weight watchers convention during the playoffs. Honestly he looks like he struggles with intensity during the season, and that gets ramped up big time in the playoffs. This year we may actually find out. I am curious which version we will get, but if it is the bad one, it will drop his trade value even lower than it already is. second in the division. they’ll make the playoffs. let’s complain. Trying to make your team better is not complaining. You can never stop trying to improve the team. i don’t think it’s your responsibility to make the Oilers better. anyway, by the looks of things, they’re already better. Better than they have been in the past 10 years for sure. How much better do they need to be? Do they need to make the playoffs? go a few rounds? win the stanley cup? After the decade of failure, what would represent “better” for you? Offloading Eberle when he’s having a bad year? Explain the trade market for a player like him? Is he a soft, overpaid liability? Is he a guy who can be counted on to get 25 goals a season more often than not? What is he, and what’s his trade value?